Hard red winter wheat (HRWW; Triticum aestivm L.) plants from genotypes selected in the Northern Great Plains of the U.S. have less tissue water after exposure to cool autumn temperatures than plants from the Southern Great Plains. It is generally assumed that the reduced tissue water content of northern compared to southern cultivars is due to an impedance to water uptake by northern plants as a result of the low autumn temperatures. We hypothesize that if low temperature impedes water uptake then less soil water would be removed by northern than by southern-selected cultivars. This hypothesis was tested by comparing plant water uptake of a northern (FR) and a southern (FS) cultivar in relation to their foliage water content at 2°C. At 2°C foliage water content of FR plants decreased more rapidly than that of FS plants, similar to field results in the fall. During 6 wk, foliage water content of FR plants decreased 20 to 25% of the pre-treatment value, compared to only 5 to 10% by FS plants. Plant water uptake was about 60 g H2O·g FDW-1 by FS plants, while FR plants maintained plant water uptake in excess of 100 g H2O·g FDW-1 during the 6 wk period at 2°C. When four other northern genotypes of equal freeze resistance were studied, foliage water content and plant water uptake change were similar to FR plants. In these northern-selected HRWW cultivars foliage water content reduction resulting from cold acclimation is not due to impedance to plant water uptake. In the Northern Great Plains of the United States, stand density of cultivars within hard red winter wheat (HRWW; Triticum aestivum L.) varies in the spring, depending on the severity of winter. Generally, northern selections have the greatest chance of maintaining stands when compared to southern-selected cultivars . However, this distinction among cultivars happens only when plants receive adequate cold induction. This occurs naturally in the autumn after planting . It also may be initiated in the laboratory during a period of 4 to 6 wk at near freezing temperatures . Kenefick and Swanson  described this interval of induction as "cold acclimation". Several physiological and biochemical changes distinguish plant genotypes during and after cold acclimation [5–10]. One such distinction among genotypes is tissue water content that decreases more rapidly in certain genotypes than others during the cool autumn season [11–13]. Martin  observed from field results that northern selections contained less tissue water in late autumn than did those selected farther south where winter freezing conditions are less severe. Nass  observed similar differences in plant water content among winter wheat and rye (Secale cereale L.) cultivars. The reduction of tissue water content in response to low temperature is believed to be due to an impedance of water uptake by the roots . Reduced root hydraulic conductance occurs shortly after plants are transferred from warm to cooler temperatures. Bolger et al. observed this effect within a few hours after cotton (Gossypium hirsutum L.) plants were transferred from 30 to 18°C. Similarly, Malone  observed a decrease in hydraulic conductance of spring wheat roots within minutes after plants were transferred from 22 to 8°C. However our research focuses on effects of a sustained cold acclimation period as occurs in late autumn rather than on changes due to transient temperature shifts. The effect of cool temperatures on lowering water content in northern-selected cultivars could result from i) inhibited plant water uptake, or ii) plant water loss exceeding uptake. If autumn temperatures impede water uptake, causing greater reduction of tissue water content in northern HRWW plants as suggested by Limin and Fowler , then we hypothesized that less water would be removed from soil at 2°C by northern-selected than by southern cultivars. This hypothesis was tested by comparing foliage water content and plant water uptake of a northern and a southern cultivar at 2°C and a photosynthetic photon flux density (PPFD) at or near light compensation. Under the cold acclimation condition of a PPFD of 4 μmol m-2s-1and 2°C both FR and FS plants maintained a healthy green color after 6 wk at 2°C, and resumed growth when re-hydrated and returned to 25°C. When the mean foliage dry weight (FDW) of six plants per cultivar (and each treatment interval) were plotted against durations of 0, 2, 4, or 6 wk at 2°C, the slopes representing rate of FDW change of each cultivar were not significantly different from zero (data not shown). It was concluded that plants were near or at light compensation. To evaluate the laboratory system in relation to reported field results, changes in foliage water content were measured in FR and FS plants after 5 wk at 2°C. Foliage water content decreased to 0.77 g H2O·g FFW-1 in FS plants compared to 0.63 g H2O·g FFW-1 in FR plants. This reflected a greater reduction of foliage water content for FR plants since the starting amount of each was 0.85 g H2O·g FFW-1. Thus even with this approximate measurement of plant water status a differential in foliage water content of FR and FS was demonstrated after 2°C exposure. A further test was performed to determine to what extent foliage water content decreased in plants maintained under our laboratory conditions. Foliage water content values were determined from the foliage wet weight and dry weight values as described in methods. The 48 hr drying at 80°C ensured the complete drying of the sample and thus accurate determination of foliage dry weight. 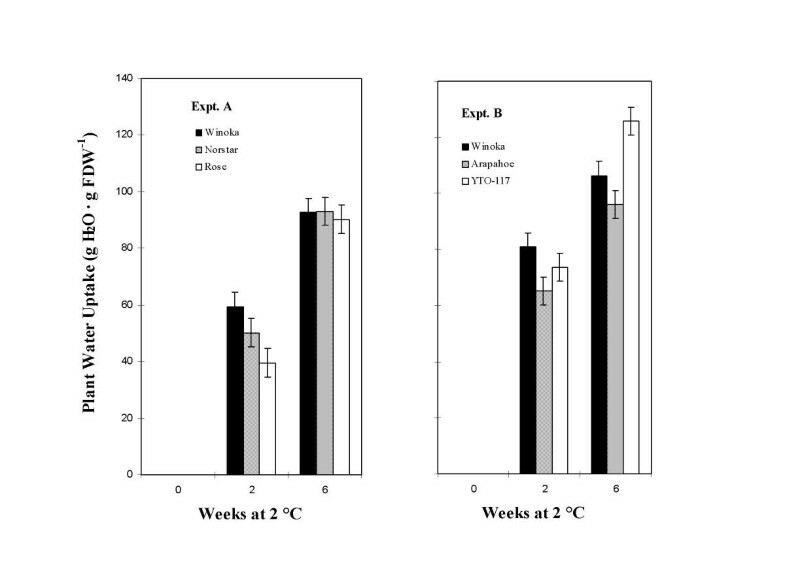 A similar reduction in foliage water content of FR and FS plants was shown after 4 wk at 2°C (Fig. 1A). However after 6 wk there was a greater reduction of foliage water content in FR plants, amounting to 14% compared to only 5.8% for FS plants. Thus a differential reduction in foliage water content of FR plants is comparable to that observed in northern and southern-selected HRWW genotypes observed in the field by Martin  and Nass  in late autumn. A Foliage water content (FWC) of plants from a freeze resistant (FR) and a freeze susceptible (FS) wheat cultivar during 6 wk at 2° C. Five-day seedlings were transplanted one cylinder-1, each cylinder contained 161 g ODS and maintained at about a Ψm of -0.002 MPa for 23 to 25 d of plant growth in the greenhouse at 25°C. Matric potential was adjusted to -0.004 MPa just prior to 2°C exposure, no more water was added. Plants were than transferred to a 2°C chamber for intervals up to 6 wk. Mean foliage water content/foliage fresh weight (g H2O·g FFW-1) or FWC for each treatment was from three plants in each of three experiments. Vertical lines on each bar indicate standard error of the mean. B. Cumulative plant water uptake/foliage dry weight (g H2O·g FDW-1) or PWU was determined from the same FR and FS wheat plants described in Fig. 1A. PWU was calculated as the weight difference between the total water removed and that evaporated from each cylinder during each 2°C treatment interval. PWU was standardized to FDW of plants. Mean PWU for each treatment was from three plants in each of three experiments. Vertical lines in each bar indicate standard error of the mean. Having ascertained that at 2°C and low light intensity foliage water content differentially decreased in FR and FS plants as described for field grown plants, we proceeded to gravimetrically measure plant water uptake from the soil. The design of the plant soil system for measuring plant water uptake was such that the possibility of water loss via evaporation was minimized. Thus reduction in weight of the system could only be attributed to removal of water from the soil by plants or plant water uptake. Mean plant water uptake was determined after 2, 4, and 6 wk at 2°C (Fig. 1B). After 2 wk no significant difference was observed for FR and FS plants, 64 g H2O·g FDW-1 and 58 g H2O·g FDW-1, respectively. Thereafter plant water uptake for FS plants remained effectively constant, whereas that by FR plants increased to 102 g H2O by the end of 6 wk (Fig. 1B). In summary, plant water uptake occurred for both FR and FS plants at 2°C. However over the entire 6 wk water uptake by FR plants was greater than that by FS plants. Similar results were also obtained in a 5 wk study comparing plant water uptake between FR and FS plants. The above findings that FR plants with the greater plant water uptake have significantly lower foliage water content than FS plants could reflect more rapid loss of foliage water by FR plants, or limiting soil water available to FR due to its rapid rate of plant water uptake. To test the latter, FR plant water uptake was measured with increased initial soil water content. The initial amount of water was increased from 50 mL cylinder-1 (Fig. 1) to 58 mL (Fig. 2A) or to 81 mL (Fig. 2B) by increasing cylinder size and the soil mass while maintaining soil matric potential constant. Comparison of PWU and FWC of FR plants supplied with A: 58 or B: 81 mL of water prior to 2°C exposure. Five-day seedlings were grown 23 d at 25°C in plant cylinders containing either A: 165 or B: 225 g ODS at a Ψm of about -0.003 MPa. These soil masses when adjusted to a Ψm of -0.002 MPa 3 d prior to 2°C resulted in the above water volumes available to plants for the 3 or 5 wk duration. Each data point is the mean from three plants, vertical lines indication the standard error of the mean. The rate of plant water uptake was calculated from a slope of plant water uptake plotted against time in wk at 2°C. From the 58 mL supply the rate was 20.3 g H2O·wk-1 (Fig. 2A), compared to 19.5 g H2O·wk-1 from the 81 mL supply (Fig. 2B). Similarity of slopes suggested that 58 mL was adequate to sustain maximum water uptake of FR plants. However, the availability of more water initially from the 81 mL supply resulted in a foliage water content decrease that approached that of plants initially provided with 58 mL. Thus we provided evidence that inadequate soil water during the 5 wk period was not the cause of the decrease in FR foliage water content. In order to determine whether the relationship between foliage water content reduction and plant water uptake was a general phenomenon among other northern-selected HRWW genotypes, four additional HRWW cultivars were studied. These cultivars together with FR have excellent freeze survival records and are used as standards in the Northern Great Plains field trials [18, 19]. Foliage water content changes are depicted in Fig. 3A &3B. 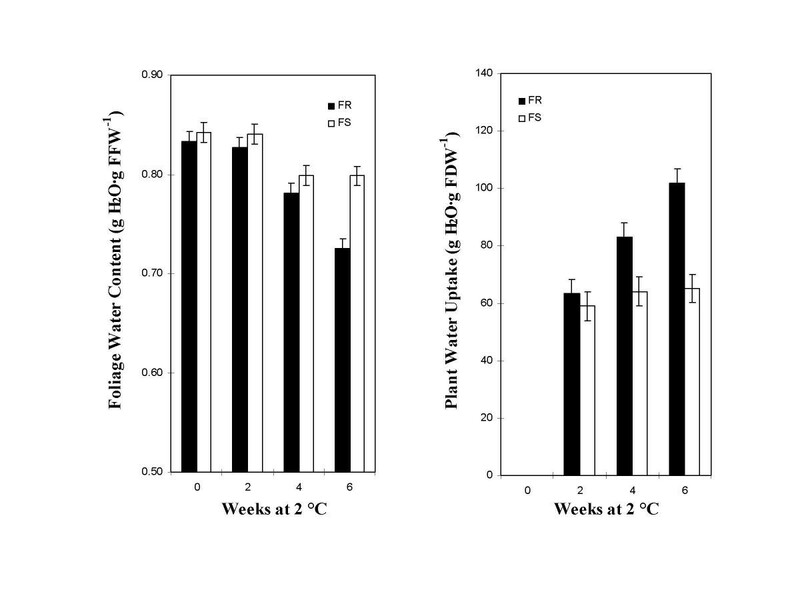 Foliage water content of Winoka, Norstar, and Rose was shown to be the same after 2 wk as before 2°C exposure (Fig. 3A). 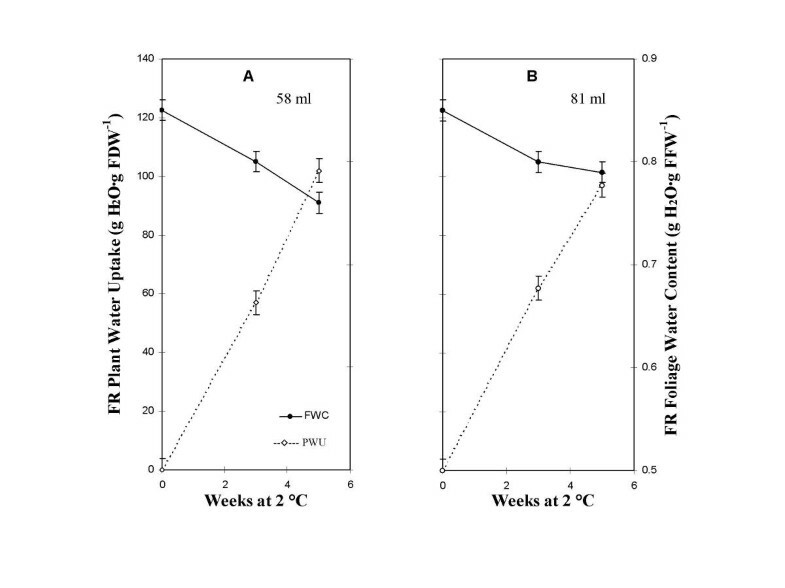 After 6 wk, foliage water content of Winoka, Norstar, and Rose all decreased to similar amounts of 0.63, 0.62, 0.64 g H2O·g FFW-1 respectively, compared to the 0 wk value of 0.82 g H2O·g FFW-1. Foliage water content (FWC) of 'Norstar' and 'Rose' (A), and in a separate experiment 'Arapahoe' and 'YTO-117' (B), northern adapted genotypes compared to the reference FR cultivar (Winoka) after soil drying 2 and 6 wk at 2°C. Five-day seedlings were grown 23 d in the greenhouse at 25°C before cold treatment. Immediately prior to 2°C exposure, soil water content was adjusted to a soil matric potential of -0.004 MPa; no additional water was supplied. Each FWC value is a mean from 3 plants. Vertical lines in each bar indicate standard error of the mean. Foliage water content among Winoka, Arapahoe, and YTO-117 plants were compared (Fig. 3B). All values decreased slightly after 2 wk, compared to that of 0.81 g H2O·g FFW-1 before 2°C exposure (Fig. 3B). However after 6 wk at 2°C foliage water content decreased by Winoka, Arapahoe, and YTO-117 plants to 0.60, 0.55 and 0.64 g H2O·g FFW-1 respectively compared to the initial 0.81 g H2O·g FFW-1 (Fig. 3B). A slightly larger foliage water content value after 6 wk for Winoka in Fig. 3A compared to that in Fig. 3B suggests lower relative humidity occurred during 2°C exposure in Experiment B. Thus, it was demonstrated that the magnitude of foliage water content decrease in these four additional genotypes was similar to that in FR (Winoka) at 2°C. 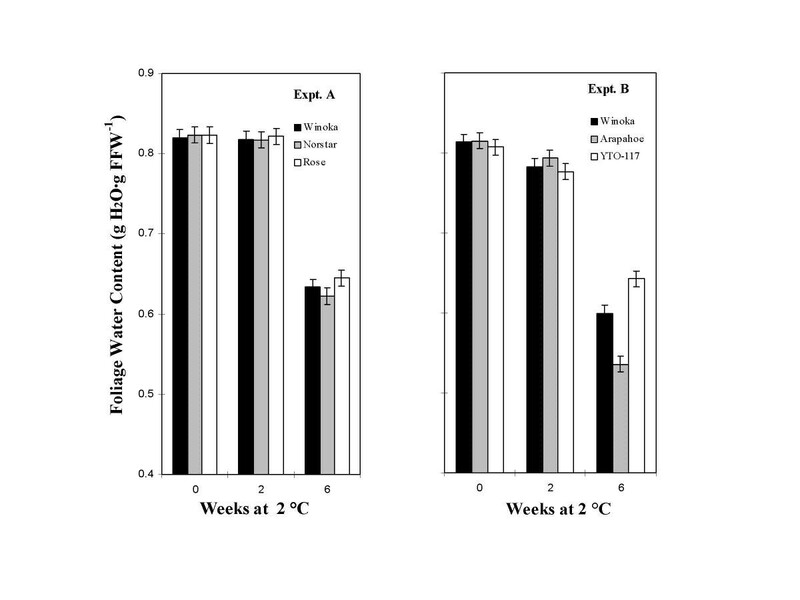 As a group, foliage water content decreased appreciably after 6 wk. Results of plant water uptake are depicted in Fig. 4A &4B. Water uptake by Winoka, Norstar, and Rose plants is shown in Fig. 4A. After 2 wk at 2°C, water uptake by Rose lagged slightly behind Winoka and Norstar. However after 6 wk water uptake by Norstar and Rose were equal to Winoka, all increasing appreciably compared to plant water uptake values at 2 wk (Fig. 4A). Plant water uptake by Winoka, Arapahoe, and YTO-117 was compared (Fig. 4B). After 2 wk the amount was similar for these genotypes, with water uptake being somewhat larger than in Expt. A, based on the response of Winoka. After 6 wk, the pattern of water uptake by plants was also greater, although more variable (Fig. 4B). Cumulative plant water uptake (PWU) of 'Norstar' and 'Rose' (A), and in a separate experiment 'Arapahoe' and 'YTO-117' (B) plants, northern adapted genotypes compared to the reference FR cultivar Winoka after soil drying 2 and 6 wk at 2°C. PWU was determined from the same plants as described in Fig. 6, data was calculated from soil water removed by each plant and normalized to plant dry weight. Vertical lines in each bar indicate standard error of the mean. Under the laboratory conditions used in this study, the results of decreasing foliage water content with duration at 2°C was similar to the findings of Fowler and Carles , Nass  and Martin . Their studies were performed on field grown plants and showed decreasing tissue water content during the Fall period. Fu et al also demonstrated that tissue water content decreased during cold acclimation in the field or in an environmental chamber. In our study, decrease in foliage water content correlated with an increase in plant water uptake (Fig. 3 &4). Based on the assumption that stomata opened during the cold acclimation period, we believe that more effective water movement occurs in FR compared to FS plants at 2°C. Osmotic potential difference between FR and FS plants account for this phenomenon. DeNoma et al. observed that during low non-freezing temperature in the field a greater decrease in crown osmotic potential occurred in freeze-resistant compared to more susceptible HRWW cultivars. We have obtained similar osmotic potential results with leaf tissue (data not shown). From this limited survey we have demonstrated that FR genotypes of HRWW have reduced foliage water content when acclimated under our laboratory conditions. We also demonstrated that plant water uptake increased with time at 2°C. We conclude that reduced foliage water content in northern selected HRWW genotypes during extended acclimation is not due to impairment of root hydraulic conductance as proposed by Limin and Fowler . Rather a tissue water deficit occurs because uptake is inadequate to replenish foliage water lost at this temperature. Our results suggest that the reduction in foliage water content observed among the northern-selected genotypes is due to greater stomatal conductance at 2°C. Control of stomatal aperture is complicated. Under the conditions of these experiments, we have ruled out the effect of photosynthesis since the light intensity was not at a level that resulted in foliage dry weight increase during the cold acclimation period . Willmer and Fricker  reported that stomata may close or open during cool temperatures, depending on plant genotype and species. It has also been reported that blue light is particularly effective in opening stomata at low irradiances, because of a generally recognized low threshold response. Further, that the blue light response of guard cells is independent of chloroplast-driven changes in CO2 that can also cause stomata to open . Thus, at an irradiance of 4 μmol m-2s-1 during 2°C exposure, it is likely that reduction in foliage water content of northern HRWW cultivars is due to induced stomatal conductance resulting from blue light rather than from a photosynthetic response. Two HRWW cultivars commercially grown in the Great Plains of United States were the primary genotypes investigated: 'Winoka' released in South Dakota  and 'TAM W-101' released in Texas . According to South Dakota Experiment Station records, Winoka (northern selected) generally has a greater stand survival rank than TAM W-101 (southern selected) in the Northern Great Plains . Therefore, Winoka was designated as freeze resistant (FR) and TAM W-101 as freeze susceptible (FS), a modification of the "cold resistance" terminology previously reported for HRWW cultivars [26, 27, 2]. Water status of four additional northern selected cultivars were also evaluated: 'Norstar' , 'Rose' , 'Arapahoe' , and 'YTO-117,' an experimental line from Montana selected in 1956 (James Berg, personal communication). The soil mix consisted of a 2:1:1 volume of silt loam (Vienna fine-loamy mixed Udic Haploboroll), sand, and peat, respectively, hereafter described as soil. Oven-dry soil (ODS) mass was determined after drying 48 h at 80°C. The soil had a bulk density of 1.13 ± 0.01 kg L-1 and a maximum water holding capacity of 0.50 ± 0.01 kg kg-1 at a soil matric potential (Ψm) of zero. Soil water was initially adjusted to maintain uniform particle distribution during and after the mixing process. Soil matric potential was evaluated by the tension table and pressure plate procedure , with soil water values between 0.10 and 0.50 kg H2O·kg ODS-1. The Van Genuchten function  was used to plot the data. Average soil water values from each sample were converted to Ψm using this plot. Plants were grown in butyrate cylinders with dimensions of either 3.8 × 19 or 4.4 × 19 cm (diam × height). The bottom of each cylinder was closed with a polyethylene cap with two slits, where ends of a 1.3 × 23 cm (width × length) wick of absorbent paper were inserted. These ends extended into the cylinder and aided in soil water distribution. Washed dry sand (30 ± 0.3 g) was added to each cylinder. Next, the equivalent of about 160 g ODS was added to 3.8 × 19 cm cylinders, or about 225 g ODS to 4.4 × 19 cm cylinders. ODS mass was used to calculate the water required to attain the desired Ψm for each experiment. Captan-treated seeds were germinated at 25°C without light, on adsorbent paper wetted with 10-4 M CaCl2. Supplies for seed germination were either autoclaved, treated with 10% commercial bleach, or immersed in 70% ethanol. Seedlings were transplanted to soil 5 d after starting germination, one per cylinder. At least a 14-h photoperiod was maintained in the greenhouse by supplementing sunlight with low-pressure sodium vapor lamps that provided a photosynthetic photon flux density (PPFD) of 150 μmol m-2s-1. Plants were grown approximately 23 ± 2 d in the greenhouse, the exact interval depending on optimum solar radiation 3 d prior to 2°C exposure (this ensures enough photosyntate to sustain healthy plants during cold acclimation). Relative daily radiation was compared to full sunlight received on June 21st, that was set at unity. Plants were discarded when they received less than 0.80 relative units of radiant energy during the final 3 d prior to 2°C treatment. Incident radiation in the greenhouse was monitored daily with a 30.5 cm2 solar panel. Air temperature was maintained between 21 and 26°C. During the final 5 d of plant growth before 2°C exposure, soil in all plant containers was adjusted daily to the desired Ψm with water. Plants were at the 4- to 5-leaf growth stage prior to 2°C exposure. Cold acclimation was accomplished in a chamber set at 2°C ± 1.5 Average daytime relative humidity calculated from wet/dry bulb measurements was 69% ± 4% during the day and 84% ± 5% at night. Nobel  reported that light compensation occurred at a PPFD between 8 to 16 μmol m-2s-1 with 350 μmol CO2 mol-1 at 20°C. At 2°C, a PPFD of 4 μmol m-2s-1 (at canopy height) was used in this study, supplied from cool-white fluorescent lamps during a 11.5 h photoperiod. This is a 10-fold decrease from the lowest irradiance reported by Gray et al. . According to the manufacturer's specifications, the spectra of the fluorescent lamps included bands at 370 and 450 nm. Before transferring seedlings to 2°C, the wick exterior to each cylinder was removed. To further minimize evaporative loss, Parafilm (Am Natl Can) was snugly wrapped around the top of each cylinder and the plant culm. Evaporated soil water (ESW) was estimated from cylinders similarly wrapped, but with foliage removed just above the culm seal prior to 2°C exposure. The amount of soil water removed from a cylinder during a designated time (t) consisted of both (PWUt) and ESWt. The term (ESW0 - ESWt) below was the amount of water evaporated from a cylinder without foliage during the interval between t = 0 and a test interval t. Initial soil water content (SW0) and final soil water content (SWt) were gravimetrically determined from cylinders with foliage removed just above the culm seal at time of placement at 2°C. The difference between the SW0 and SWt reflected the amount of water taken up by the plants (PWU). At least two control cylinders (containing plants without foliage) were randomly spaced among plants during each experiment, from which the mean ESWt was calculated. PWU was standardized to foliage dry weight (FDW) of each plant. Preliminary tests compared FDW to total leaf area of six plants from each FR and FS cultivar, area determined with the Delta-T Image Analysis System (Dynamax Corp). Leaf area correlated with FDW therefore, relative PWU of FR and FS plants was expressed as g H2O·g FDW-1. At the end of each 2°C treatment interval, the foliage of each plant was excised 2 cm above the soil surface. Foliage water content (FWC) was determined from foliage fresh weight (FFW) and foliage dry weight (FDW) using the equation FWC = (FFW - FDW)·FFW-1. FDW was determined after drying the foliage 48 h at 80°C. FWC was expressed as g H2O·g FFW-1. The authors are grateful to T.E. Schumacher for the soil water retention measurements and technical advice. We would like to thank Lucinda Olson for assistance in preparing the manuscript. Seed stocks were generously provided be Darrell Wesenberg and staff, National Small Grains Germplasm Facility, Aberdeen, ID, 83210. Partial funding of this research from the South Dakota Wheat Commission is gratefully acknowledged. South Dakota Exp. Stn. Journal article 3192.